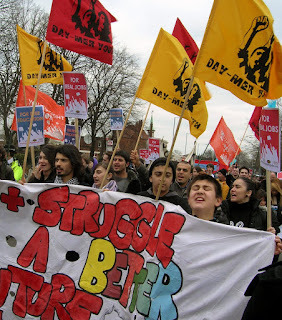 I was proud to carry the Lewisham NUT banner on the Youth Fight for Jobs march today through the streets of Barking, where the BNP's leader Nick Griffin is hoping to be elected MP. As the demonstration went through the council estates and streets, residents came to their doors to hear our chants calling for workers' unity against racism and against public sector cuts: "When they say cut and privatise, when the BNP tell racist lies - We fight back and organise"
The car horns from motorists and the many leaflets taken by those we passed showed the welcome the march received. One local community worker who joined the march explained to me how the BNP had few active members in the area but that they had won council seats out of the frustration of local voters for the way the main parties had treated them. He hoped to work with Youth Fight for Jobs in Barking to offer young people a way forward in fighting for a future and in rejecting the BNP. Trade unions have to campaign to expose the lies of the BNP - but we have to go further. It is the fact that all the main parties share the same policies of cuts and privatisation that allows the BNP to pose as something different. We need to offer a real alternative at the ballot box. That's why I have called in my election address for unions to support anti-cuts candidates for councillors and MPs as another weapon in challenging the attacks facing teachers and education.